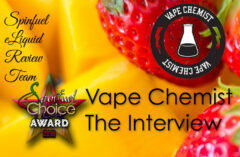 Make sure to check out the in-depth e-liquid review for the entire Dr. Juice line here. Dr. Juice : Yeah, Sure…Hi guys this is Jeremy Fuss; owner of Dr. Juice. What’s up, this is Josh Edwards President of Dr. Juice. Dr. Juice : (Jeremy) Back in 2013 I was working in a vape shop that created their own house juice. I never had the opportunity to see what they did or how they did it, but I decided to give it a shot. I quickly found that I enjoyed vaping my own juice and decided to open my own vape shop. I started selling my juice to generate funds to open up the shop, but then then Dr. Juice took off and I decided to make this my sole business venture. (Josh) I was working doing corporate sales. I loved what I did, but I needed more vertical growth in an industry I actually enjoyed and loved. Jeremy is a good friend of mine and offered me the opportunity to work with him if I wanted. I made the decision to leave that job a little over a year ago and to work for Dr. Juice. I have never looked back. Dr. Juice : (Josh) we are headquartered out of the greatest city in world Pittsburgh Pennsylvania! Yes, we sell online, but our primary dealings are with wholesalers. We are offered in shops from California to Maine. We have a heavier presence within our tristate region, but are growing quickly. (Jeremy) We work with several distribution companies nationally and are always looking to take on more, especially to help in the distribution to other countries. We are set up to ship internationally, but with an international distributor it would make it a lot easier to streamline the process for our wholesalers and customers alike. SPINFUEL: How would you describe the Dr Juice e-Liquid flavor signature? Dr. Juice : (Josh) We have worked hard to establish a brand that not only prides itself on its product, but also on its customer service. As far as our flavors go, we took a long time to develop the platinum line. We believe that each flavor matches its description dead on. (Jeremy) Each one of our flavors which range from, dessert to cereal to fruity provides a full bodied well developed multi-layered vape. We created a line that every vapor regardless of preference can find that “all day” vape! Dr. Juice : (Jeremy) we have partnered with a bottling company that has a facility far beyond what most companies are using today. We decided early on that our number 1 goal should be to provide a safe product for our customers. Even though it takes away from the bottom line we believe that the customer should come first. The company we partner with is Purilum LLC, based out of Greenville, North Carolina. They do batch testing and everything is traceable back to the original raw materials. http://purilum.com/about-purilum/ (See website for more information). SPINFUEL: Do you have a specific audience in mind for your two formulations of your eLiquids, the 60/40 and Max VG? Dr. Juice : (Josh) we have actually recently decided to phase out our 60/40 blend. Originally this blend was made for people who were using starter kits but still wanted high end juice. With our ever expanding industry, most people that are starting now jump right into sub ohm tanks or something similar. We did extensive research and found that our Max VG line works great out of these tanks, and of course drippers, so that’s how we are moving forward. Our Max VG line, while not 99% like some companies, provides a great flavorful vape that still produces plenty of clouds for you cloud chasers out there. Dr. Juice : (Jeremy) Yes, we do have a wholesale program. We are running a deal for Wholesalers so they can get a free sample pack and will receive 10% off their first order when they mention SPINFUEL. If you have any questions or concerns you can contact Josh directly at the bottom of the website. Dr. Juice : (Josh) We have attended a few conventions including ECC in Pomona, California this past summer. We have plans to be at many up the upcoming events for 2016! SPINFUEL: Do you have a “favorite” flavor in your line? Dr. Juice : (Jeremy) My original favorite flavor was Crunchberry which is still our number one seller. However, recently I’ve been really into Delish since my pallet is starting to trend more towards dessert style flavors. (Josh) Though I love all of our flavors on the platinum line, I absolutely am obsessed with Enigma. It is hands down the best Apple pie vape I have ever had! Before I started working with them Enigma is what I bought consistently. Over a year later it is still my all day vape! 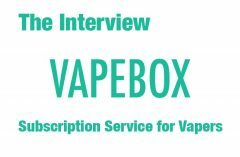 Dr. Juice : (Jeremy) I believe there are multiple things that go into an all-day vape. First off I believe it starts with the consistency of each bottle you purchase. Next it comes down to the flavor profile being something that not only grabs your attention but makes you keep coming back for more. And finally all of our flavors have a beginning middle and end to ensure they are complex and complete flavors. SPINFUEL: Where do you think the e-cigarette industry is headed? Do you have any predictions on the upcoming FDA regulations? Dr. Juice : (Josh) When it comes to the FDA regulations, I choose to be optimistic! I can be optimistic because as a company we put in the footwork by being part of SFATA, CSAA and meeting with our local representatives to fight for our cause. Unfortunately, they are trying to regulate our industry out of existence; which is truly sad because I believe it can save people’s lives. I do not have any predictions, but I promise you we will fight until the very end. Dr. Juice : (Josh) because it’s the best juice our there! There are hundreds of juice companies that use fancy branding to get customers to buy their terrible juice. (Jeremy) We might not be the biggest name out there yet but what we provide is amazing juice and isn’t that what everyone really wants? Dr. Juice : (Jeremy) we have a new flavor that will released very shortly. It is currently being beta-tested as we speak. It is a grape cream soda and will be a game changer. As far as how many flavors will be on the line? All I can tell you is to stay tuned and we will continue to grow and change with this industry. Dr. Juice : (JOSH) PLEASE GET INVOLVED IN ADVOCACY!!!! SPINFUEL: We couldn’t agree with you more. In fact, our column published yesterday encapsulates the beliefs of our entire staff. Thank you for sitting with us, we look forward to new eJuice from Dr. Juice!